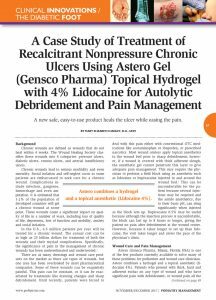 Astero® is the only FDA-cleared prescription hydrogel and 4% Lidocaine HCl for pain associated with wound healing and vasculitis. 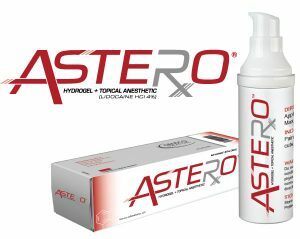 Available by prescription only, Astero® provides superior wound healing and has a rapid onset of action in 3-5 minutes. Clinicians, treating patients with wounds, concerned with wound pain management should consider Astero® as the first choice in wound therapy. Astero® is a FDA-cleared hydrogel plus topical anesthetic (Lidocaine HCl 4%) indicated for painful wounds such as ulcerations, pressure wounds, first and second degree burns, post-surgical incisions, cuts and abrasions. Apply to the affected area as directed. Maximum 12 pumps per day. Metered Dose Technology (MDose™) dispenses the exact amount of medication. 1 pump = 1 dose (0.25 mL/pump). 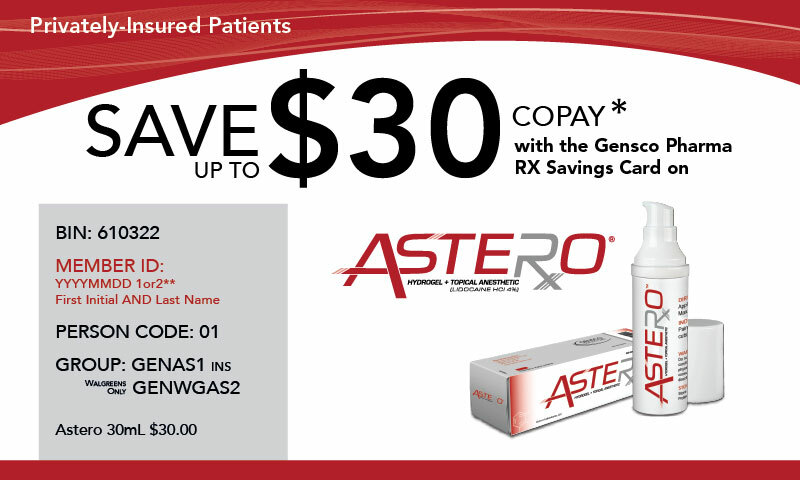 Astero® provides fast pain relief with an onset of action within 3-5 minutes. Each pump is a measured dose for simple adherence. 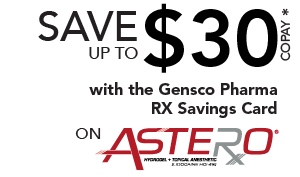 All Gensco® products, including Astero®, are distributed to pharmacy chains such as Walgreens®, CVS®, Walmart®, RiteAid®, Kroger® and Publix® through the major wholesalers such as McKesson, Cardinal and AmerisourceBergen. Astero® is contracted with DAPA (Contract #SP0200-15-H-0003), Federal Supply Schedule (FSS) (Contract #V797D-70219), making it accessible to all military personnel and is also available to all MEDICARE patients (Medicare Contract #P1466). Astero® is available through these Group Purchasing Organizations (GPOs): Intalere, Innovatix, MedAssets, Premier, MHA, ROi and Vizient. 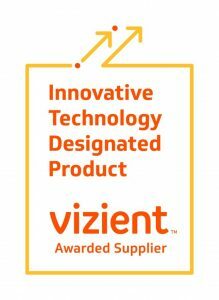 Gensco’s Astero® has received an Innovative Technology contract from Vizient, Inc., the largest member-driven health care company in the country.